A HALF MALE , HALF FEMALE BIRDIE IS FLYING AROUND IN PENNSYLVANIA!! APPARENTLY, THE LGBTQ WERE RIGHT! They ARE born that way!! LOL! - Amirite? - Post your opinion and see who agrees. 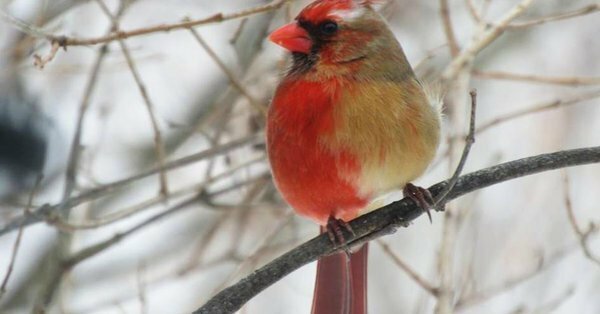 Rare half-male, half-female cardinal spotted in Pennsylvania: report | Fox News A rare half-male, half-female cardinal was first spotted in Pennsylvania a few weeks ago, a report said Thursday.-3 A HALF MALE , HALF FEMALE BIRDIE IS FLYING AROUND IN PENNSYLVANIA!! @Piper2 What a beautiful little bird. That it is. I'm headed out to restock my feeders. Too bad. It's zero and 15" of snow & ice on the ground. I'm feeding them, consistently. Must have flown in from Montreal. Ask them. Daniel Hooper, a postdoctoral fellow at the Cornell Lab of Ornithology. Maybe it has the aviation version of Klinefelter Syndrome. I wonder which bathroom it uses? I guess that means the male half is doomed to a life of listening to the relentless chirping from the female half...jk...Beautiful bird, tho. Usually seen, riding on the shoulder of a half male, half female Bigfoot, during a full moon....not half moon.... a common mistake.